Every pitch shot you hit has to have a finish position and that’s what we’re going to look at right now. After impact the clubhead has to continue swinging. At the moment of impact when hitting a pitch shot the left hip has to turn back behind you in order for the clubhead to come out of the ground. If the lower half of your body does not turn out of the way, the club head will have a tendency to get stuck in the ground. If you turn the left hip out of the way too soon in the downswing the clubhead will not reach the bottom of the arc, and you will either top or scull the golf ball. 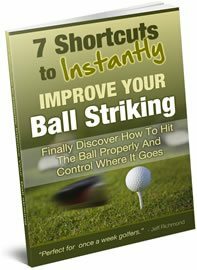 Most of the times when you are faced with pitch shots around the green you won’t need strength to make a successful golf shot. Turning the left hip out of the way does not have to be associated with strength. The left hip turning out of the way plays two crucial roles. 1. Turning the left hip makes sure the leading edge does not get stuck in the ground. When you turn the left hip out of the way it allows the clubface to stay square through impact and continue on around you on the arc allowing the golf ball to start on target. That is the completition of this pitching eCourse. I hope you enjoyed it and benefitted from it. 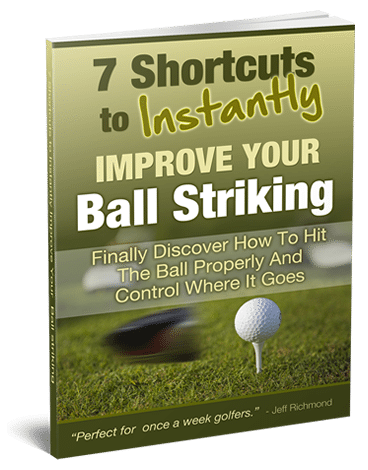 To help improve your pitching game even more I strongly recommend you click the link below to the Pitching DVD and purchase that as it will help to improve your pitch shots even more and slash shots from your scores.